How wetlands form, control and clean water, and provide wildlife habitat. Why wetlands are sensitive to disturbance and the water-related problems caused by the destruction and degradation of wetlands. Examples of community goals that can be achieved through locally-led wetland protection, restoration, and management. Policy options that can be used to preserve and restore the benefits provided by wetlands. Exploring the Relationship between Wetlands and Flood Damages. At Wisconsin Wetlands Association, we have long understood how the water storage capabilities of wetlands alleviate flooding problems. But limited awareness of how wetlands can protect infrastructure during heavy storms means that communities aren’t yet looking wetlands as effective solutions to their water challenges. With this publication, we hope to change that. 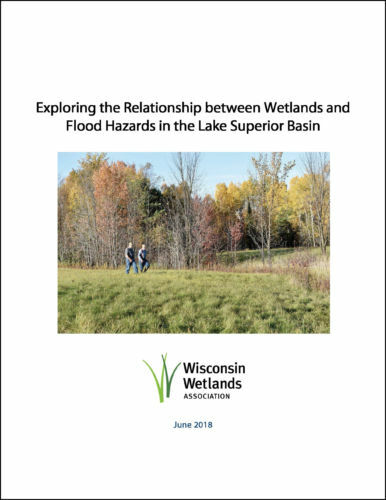 While the case study in this publication focuses on the Lake Superior Basin, cost-effective wetland restoration can be implemented across the state to help communities be resilient to severe weather and floods. How healthy wetlands contribute to resilient watersheds, including how wetlands work in aggregate to manage rainfall, snowmelt, and runoff. The process of erosion-induced wetland drainage, which substantially contributes to downstream infrastructure vulnerabilities (like gullies and other eroded features) that are reducing watershed storage by accelerating natural drainage of existing wetlands. The many opportunities that exist to rehabilitate functional wetland hydrology and arrest erosion-induced drainage with simple, cost-effective grade stabilization techniques. 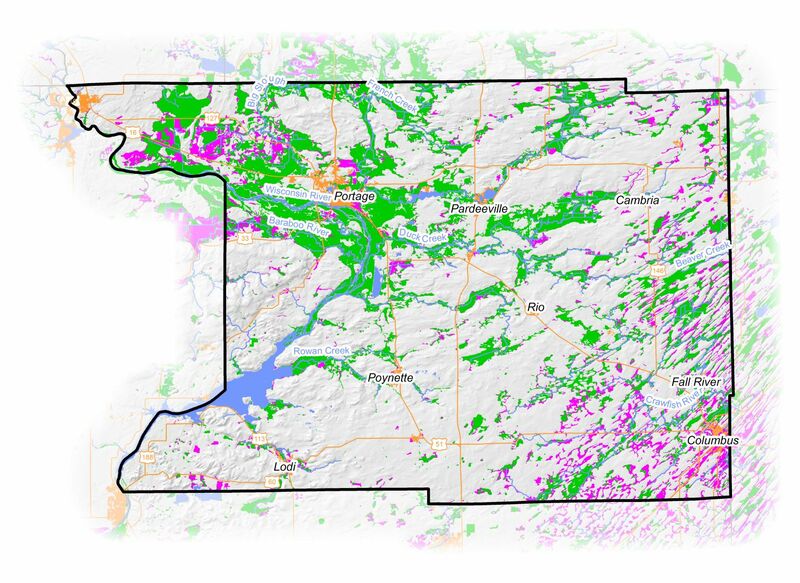 How existing data sets underrepresent historic wetland acreage. Since communities may not have records of the full extent of disrupted wetland functions, field reconnaissance and local knowledge will be essential to identifying strategic wetland restoration opportunities. This tool illustrates common indicators to help determine whether a wetland is or was present at a site. The Quick Guide can be used on site visits to help determine buildable areas and improve consideration of wetlands in land use decisions. This publication explains the different types of wetlands found in Wisconsin and how to recognize them. This introductory guide can help you understand the diversity of wetlands found across the state. You know the benefits wetlands can give your community – now you want to get to work. To help you get started, we’ve put together a Model Wetland Conservation Ordinance that you can adopt in full or use to identify policy options that work best for your community. Ensure land use decisions with wetland implications are made in accordance with local priorities and not in detriment to reducing ongoing water-related problems. Consider wetland impacts that are not addressed by state and federal law, such as those caused by activities outside of a wetland that alter the course of water and sediments flowing into or through the wetland. This model ordinance does not create a new wetland permit requirement. Instead, it provides ways for your community to consider wetland benefits, and potential impacts to those benefits, in the review and approval of land use decisions. This includes land use decisions, such as conditional uses, variances, rezoning, plats, and land disturbance and erosion control permits. A wetland conservation ordinance or select wetland policy options can also be used as an implementation strategy to comprehensive plans, hazard mitigation plans, and other relevant planning documents. How can my community use the model wetland conservation ordinance? Adopt as a stand-alone Wetland Conservation Ordinance. Requires identification of whether zoning, land division, stormwater, or other land use ordinance would be subject to the stand-alone WCO. Adopt as a section of the general zoning ordinance. Requires clarification of how and when the wetland conservation standards apply. Incorporate select policy options into existing ordinances. Ordinances that could be revised include but are not limited to: general or shoreland zoning, land division, and erosion control and stormwater management. Do communities have the authority to adopt local wetland protections? Yes. State statutes grant counties and municipalities the authority to enact ordinances or other policies to promote public health, safety, and general welfare and to further the orderly layout and use of the land. A wetland conservation ordinance or select wetland conservation standards can be adopted in support of these goals. Tribal nations have the authority according to their respective laws and regulations. Doesn’t the Wisconsin Department of Natural Resources and U.S. Army Corps of Engineers protect wetlands? Yes, but these protections may not address local concerns. Your community has the clear authority to preserve the benefits provided by wetlands and to have a say over harmful activities that may not be covered by federal and state laws. For example, like lakes and rivers, wetlands are affected by activities on lands that drain to them and can be harmed from land disturbing activities outside the wetland boundary. WDNR and USACE can only discourage activities that occur immediately within the wetland, such as the placement of fill to construct buildings. Are communities limited in the types of wetland policy options that can be adopted? No, with some exceptions. County, municipal, and tribal governments have the authority to adopt a wide range of policy options that preserve the benefits provided by wetlands. Read this legal memo for more information on the authority and minimal impact of recent legislation that restricted how communities can regulate shorelands, or areas near lakes, rivers, and streams. We can help your community identify opportunities to address community-established goals and priorities through locally-led wetland conservation. Contact us today if you would like guidance or input on how to initiate a wetland planning project or to incorporate wetlands into local planning processes. Fact sheets are currently available for the counties included in the list below. Fact sheets for additional counties will be released when funding is secured. For more information about the limitations of these maps, read our brief disclaimer about wetland data. Need help putting these tools to work? We can help. We offer a variety of services to help communities improve local wetland plans, policies, and practices. Learn more about how we can help you put wetlands to work for your community.